There’s so many damn used tires littering the sidewalks of this grungy town, Los Angeles should incorporate them into the city seal. Thankfully tires make a fine raw material for building projects and Homegrown Evolution has been experimenting with their many uses over the past year. This week we built a compost bin. Step one is to cut out the sidewalls. You might be able to do this with a sharp knife, but it’s much easier with an electric saber saw. We used a knife to cut a slit to get the saber saw started. Once both sidewalls are cut out you just stack your modified tires up, fill it with compost, put a cover on it (we used a piece of scrap aluminum), and fetch a beer. We’ll post another tire project soon. Looks great! And so easy, even I can do it. 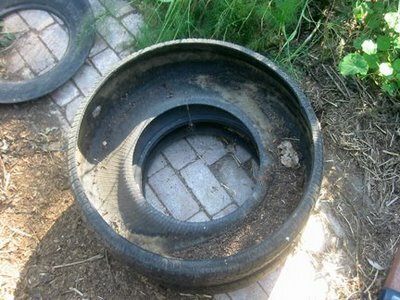 Are there any issues with lead or other contaminants leaching into the compost from the tires? Note the pro and con debate in the comments. This is THE COOLEST THING I have seen all day! 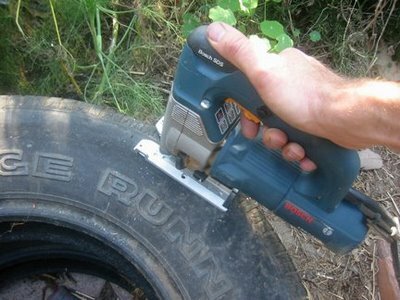 Thanks for posting – I’ve always wanted to see what people did with tires. Seems that the use of whole tires presents different issues than shredded. I *like* this idea, and it would give me lots of small compost bins I could tuck behind the shrubbery, from free materials. Great idea! I live in an subdivision under construction and tires are constantly littering my street. 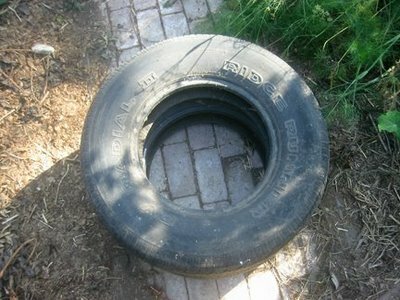 I would question using the tire compost in a veggie garden however, used tires are soaked with oil and chemicals. But an inventive solution none the less! i think this is a pretty sweet idea, i mean all of my tires are going to potatoes, but the idea is pretty similar. in fact, is it even necessary to cut out the sidewall? or should i start my potatoes with the sidewalls out? This is awesome. I’ll have to share photos of the tire chairs I designed and created I’ve become a pro at cutting tires. I’ll be doing a geurilla installation with the chairs in a public space in Pomona over my winter break. I’ll send over a link when I get photos up. This is so timely! We bought a property this year that is litter all over with old tires. I saw how someone was growing potatoes in a stack and thought, “How can I build a composter out of them.” YOU answered my question!!! Thanks! If you ever run out ideas on what to make out of those tires you find around, here are instructions on making sandals out of tires. I hope to try that as project in the near future. I use tires with both sidewalls cut out to protect young trees. I put down a thick layer of newspaper up to 40 pages thick then put straw to mulch on top of that. When watered deeply the plant stays moist for weeks without further water even in our arid climate. The side walls that I cut out make excellent mowing strip rings around olive trees that dont require deep mulching – and the rings hold in a couple of inches of wood chip mulch around the olive trees that stops weeds and grass invading the new olive trees. Old Tractor Tires with sidewalls cut out make awesome raised garden beds – again use the sheet mulch method to smother weeds. Ive used tires for many seasons to grow vegetables, flowers… you name it. If they are leaching noxious chemicals into the soil, you can fool me. I reckon that once the tires are exposed to the elements, they pretty much become devoid of nasties. So you wan the oldest,grungiest ones you can find. Besides how many people create raised bed gardens from treated wood? In both cases, any real evidence to condemn the two has yet to surface. Aesthetically, tires are lacking. You can flip them inside out and even paint them, however, which helps overcome their low-brow beginnings. And re-purposing them doesn’t get rid of them – they’ll outlast most of us here at Tiznotta Farm. But they are free and they have a myriad of uses. Good enough reasons to use them on the urban homestead, in my humble opinion. That’s a neat idea! Now those tires have a second life in the garden! 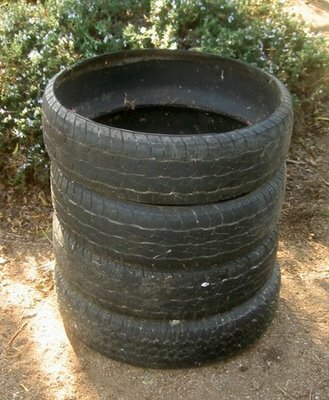 This is a great idea of converting old tires into compost bins. Not only this helps to put old tires into good used, the compost bins created help to promote green living by creating your own compost which is great for your plant. Great to see this. I’ve been using tires for a number of years now… to hold in heat for potted tomatoes etc… and also as a compost. I love that once or twice a year, each tire gets taken off and the compost can be turned over etc… and when the compost gets full over winter (freezing here in Canada) I just add another tire or two… PURRFECT! The author cites a whole host of studies on it. 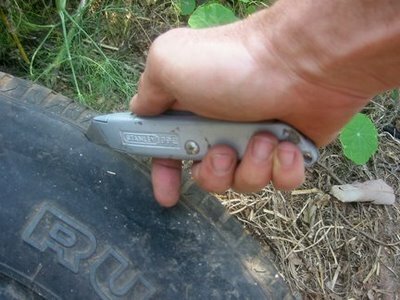 Bottom line – tire crumbs and pellets will leach a lot of zinc into the soil. Old, whole tires? Nope. Nothing to worry about. And by the way, zinc is not a “toxin” as many articles on this subject claim. It’s an essential nutrient. Like many other essential nutrients, too much is bad. That doesn’t make it a toxin! Anyway, we’ll be planting potatoes in some tires soon, if I can scrounge up some free tires. Mark, Many thanks for sharing that report.